Charlie stopped barking as soon as he saw me. I knew now why he had been quiet for the past few minutes. He’d been digging away in the dirt, which he resumed upon my arrival. I looked for his leash and spotted it a few yards away, half buried by the dirt he flung to all sides. I picked up the leash before Charlie could get to it first. As soon as I did, I also spied what appeared to be an animal bone. Most likely a deer. 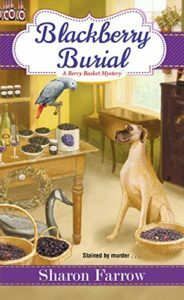 I am so excited to be talking to Sharon Farrow, and not just because I’m a fan of her Berry Basket Mystery Series. 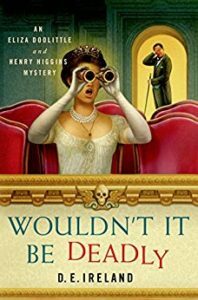 With her friend and fellow author Meg Mims, she also writes the delightful Eliza Doolittle and Henry Higgins Mysteries as D.E. Ireland. In fact, Sharon talks a little about how writing the first book in that series, Wouldn’t It Be Deadly, was somewhat challenging to the friendship. Luckily, the partnership survived; not only are the books themselves great fun, I think Sharon and Meg win the Best Cozy Title Award with every novel. You can also check out her romances, written under the name Sharon Pisacreta. Truly, Sharon has written something for everyone! Sharon also makes a great case for why cozies matter. Those of us who love them don’t have to be convinced, but there are times when cozy novels are dismissed as unimportant. As Sharon says, there can be enormous comfort in a good cozy, and that is just as valuable an emotion as those generated by a good thriller or noir. She herself reads Laura Childs, Cleo Coyle, Bailey Cates (who was new to me, woot! ), and she mentions her debt of gratitude to Gillian Roberts for her Amanda Pepper mysteries, which helped Sharon through a difficult time. I don’t normally ask for comments, but if anyone wants to share a book that helped them through a rough go, I think that kind of recommendation is a real gift we can give each other. You can find Sharon at SharonFarrowAuthor.com, the D.E. Ireland Facebook page, and on Twitter as both @SharonFarrowBB and @DEIrelandAuthor. As always, if you’d rather read than listen, the transcript is below. Enjoy! Laura Brennan: My guest today is the author of the Berry Basket Mysteries, delightful cozies full of friendship, warmth, and, of course, murder. But Sharon Farrow is no stranger to the genre. She is an award-winning author of romantic stand-alones, short stories, and — as half of the writing team D.E. Ireland — the Eliza Doolittle and Henry Higgins Mystery Series. Sharon, thank you for joining me. Sharon Farrow: Thank you for having me, Laura. LB: You’ve been writing professionally for quite a while. LB: You had an award-winning debut novel. You kind of jumped onto the scene with Stolen Hearts. SF: Yes, that was gratifying because I didn’t grow up either reading romances or even planning on being a romance writer. And I sort of stumbled into the genre. And to have my first novel win Best First Book was a surprise and quite wonderful. So, yes, I’m very pleased about that. And I’m still surprised. Looking back, I’m still surprised about that. LB: What interested me is that it has elements of romance and adventure and, sort of, bad guys, and it’s an historical. SF: Well, most of my romances involved a great deal of mystery and danger and some serious villainy in it. In fact, one of the manuscripts my editor refused to publish because she thought there were just too many unsavory characters in it. SF: This was during the 1849 Gold Rush in San Francisco. And I had researched it thoroughly, so I knew the kind of people that were going out there to make their fortune. And they said, no, there’s just too many people here who are sordid and unpleasant and dangerous. So that one never saw the light of day. LB: At that time, there were a lot of unsavory characters. SF: Oh, absolutely! I probably did more research for that particular book than any other book I’ve ever done. It was one of the first books I’d written and I just got buried in research, I loved it. And it was fascinating, because many of the very first people who went out to the Gold Rush were gamblers, riverboat gamblers. Because when word came that gold had been discovered in San Francisco, it first came through the ports in Louisiana, and that’s where a lot of riverboat gamblers were. So you had a lot of very, sort of con artists, hucksters, people living on the edge who immediately fled to California. And I thought it was fascinating and I used a lot of these people in the book. But apparently it was a little too realistic for the romance. LB: Oh, well, I hope that the research manages to resurface in another book. SF: I haven’t figured out another way to use the 1849 Gold Rush, but maybe I will. I mean, I still have piles of books, still, on the Gold Rush. LB: You come by that kind of research honestly: you have been, among other things, a college history professor. SF: Yes. I taught Ancient History, I taught Western Civilization. And I was an archeologist, I worked on digs from Roman Forts in England to Native American sites in Illinois, even Ellis Island. So I love history. It’s one reason I’m drawn to historical fiction. LB: I think that’s absolutely fascinating. You worked — the term you use is a “Lead Investigator” on an archeological site? SF: Yes. That’s what you call archeologists; the people that are running the sites are principle investigators. It’s like solving a mystery. You don’t know really — you are assuming you know what’s underneath the surface, what are you going to find in a ground by a church or a former Civil War fort, all of which I’ve worked on. You’re never quite sure what you’re going to uncover or when, and in what condition. So it really is like investigating a mystery. What are we going to find? And I’ve had some really interesting surprises that have been so satisfying. I remember one time I was in Southern Illinois and uncovered a 2,000-year-old arrow point, a Snyders point. We didn’t expect, we were just in the middle of conversing and it was my turn to be in the pit excavating with the trowel, and here was this gorgeous, in perfect condition, arrowhead. We didn’t expect it, and there it was. LB: That is very neat. And I do see the metaphor working very much for some of your detectives. SF: What I like especially about, not just mysteries but about historical fiction, is you’re recreating a particular time period and the people who would have lived in it. And one of the very earliest — because I had to study this as an archeologist — one of the earliest people to get interested in archeology was an Italian in the late Renaissance, who began to dig around for ancient artifacts. And people thought he was crazy. And they asked him, what are you doing this for? And he says, I’m bringing the dead back to life. And that’s really how I view historical fiction. It’s kind of literary resurrection. So I find all historical novels fascinating, particularly if the research is well done. I think we do a service to the past and the people who lived in it, no matter if it’s historical romance or historical mysteries. LB: Oh, I love that. That’s beautiful. LB: You do have an historical series, although it’s not based on real people, it’s based on fictional people. LB: How did the Eliza Doolittle and Henry Higgins series come about? SF: Well that we have to thank to my best friend, Meg Mims. We’ve known each other since college, we each write separate books. And she had been talking for a while — she loves “My Fair Lady.” And she was driving over, we live on opposite sides of the state, she was driving to my house listening to the soundtrack of “My Fair Lady” on the way here. And as soon as she got here, she said, “I have a great idea. You and I have to collaborate on a book, a mystery, starring Eliza Doolittle and Henry Higgins.” And I thought it was a great idea. We were just a little bit nervous, we had never collaborated before. It took us a while to do that — the collaborative aspect of it was the thing we really had to work out. Much harder than actually putting the book together. LB: So how do you do it? Does one of you write an outline and the next a draft? SF: I’m a big plotter. I’m the outliner, so I’ll write a really extensive, like 30-page, single-spaced outline. And then we assign chapters to each other. And we go off and write them. Then we critique each other’s chapters, and that was very tricky in the beginning. We’re lucky that we were such good friends for so long, because it might have ended the friendship in the beginning because we were critiquing. You know, every author is very protective of their work, and we had to have an equal say in the book. So it was just difficult to work that out. Wouldn’t It Be Deadly was our first novel we did together, and it probably was the most onerous. It’s been much easier since then. But collaborating is hard. And takes longer than writing a book on your own. SF: Yes. Yes, it does. LB: Especially probably at first because you’re coming up with the voice of the novel, which has got to be from either of your own individual writing voices. SF: Well, the interesting thing — I think what works to our benefit is that we write in the third person and we have two main characters. So we have to both write in the point of view of Henry Higgins and Eliza Doolittle. We both had to become very conversant with that. So we’re not writing in our own voice per se. And when we do go over each other’s work, many times, we do it so that it’s one voice that comes out in the end. And we’ll have very long, long discussions — no longer heated discussions, but they were in the beginning — when we agree on everything from the punctuation to where that scene should go or if we should cut it. And then at the very, very end, we do a read-aloud. We read aloud the entire manuscript. It’s comprehensive. I’ve talked to Charles Todd, both the mother and son, and I know that they work differently. A lot of people have their own views on how — some people just do the plotting, some people just do the writing — but we are involved every step of the way together. But it helps that we’re like family, we’ve known each other since the 1980s. LB: You two definitely win for Most Clever Titles. Move Your Blooming Corpse is hands-down my favorite cozy title ever. SF: Oh, thank you so much! At the moment we’re working on With A Little Bit of Blood. That’s sort of our ‘country house’ mystery. We realized — we’re trying to do kind of a parody on “My Fair Lady” titles or lines from the play or movie — but we’re going to run out, we think, after the fourth one. So it’s probably going to take us a couple of months to come up with titles for the rest of the series. We’ve gone through all of the “My Fair Lady” songs, and I think we’ve wrung the last drop out of being able to use them as mystery titles. If you have an idea, Laura, please, let us know! LB: I’ll put my thinking cap on. Thank you, I’d love to be of service with that, that would be fun. So now you have a solo series. You have the Berry Basket Mysteries. SF: I moved to Saugatuck, which is on Lake Michigan in 2008, fell in love with this area. It’s beautiful, a lovely resort town surrounded by orchards. And I came here after a pretty difficult time at home, my dad went through a long illness, and I was kind of just drained and totally stressed out. And this village was solace to me. It kind of brought me back to life. And I wanted to thank the village in a way, I wanted to let people know how beautiful this area is and this small town is. That was really one of the big reasons I wanted to write the Berry Basket Series. LB: That’s interesting, too, because that is, in fact, often how the heroine starts out in a cozy. LB: Where she has had a very difficult time elsewhere and comes back and finds solace in the town. SF: Yes, yes. I mean, my heroine does that as well. She’s had a hard time in New York, a lot of scandal-plagued career problems and personal problems, and comes back. But I have to say, you know, you would think it’s a cliché except that I went through it. And coming here, it’s very different living here in a town of just a thousand people than living in Metro Detroit, and I used to live in New York City. Completely different vibe, different way people interact with each other. And being surrounded by nature is something I’d never had until I moved here. It’s just — it’s wonderful. LB: Yeah, I don’t think it’s a cliché — or if it is, I think it’s because it really resonates deeply with a lot of people. LB: Even if we don’t live in a small town, there is that warmth. SF: Everyone here knows everyone else. I wasn’t here more than a few months and I knew people were talking about me. “Oh, did you see Sharon at the coffee shop?” “Oh, I saw Sharon was at the library.” I would hear this from other people. It’s like, oh, they already know who I am. It’s kind of sweet. LB: So Marlee Jacob is your heroine. How did she develop? SF: She’s too sarcastic. Or she’s too this, or too aggressive. And I don’t say anything because you don’t reply to reviews, but I’m thinking, Marlee is actually me. When Marlee talks, that is really my voice, more so than any book I’ve ever done because I’m writing in the first person. Marlee Jacob is me. I had a very checkered romantic, weird career. I mean, I was lucky to find a wonderful man and get married finally, but I also had adventures in New York, and I tend to be sarcastic, and I’m very loyal to my friends. And I’m Marlee. But I do read, once in a while, “I like her other characters, I just don’t like Marlee.” And I think, oh! You wouldn’t like me. [Laughter.] But not everyone can like you, nor can everyone like your heroine. So I don’t blame them. LB: Well, one of the things I love about the Berry Basket mysteries is the complexity of the friendships. Marlee, she loves her friends because of their flaws, not really in spite of them. She embraces who they are completely. SF: Well, you know, you have to have very complex, human characters. If someone is all black and all white, it doesn’t make for anything very interesting. You know where the story is going to go. And if I have flawed characters, I can draw on that in future books, which I do. I need a rich supporting cast. So you have to make them as interesting as the main character. LB: And they are. And, interestingly, I know Marlee loves them all equally, but I have mixed feelings about some of them. But it only serves to, I think, make the story itself more interesting when one of them surprises me. SF: Because I created them, they’re like my children. So I don’t really have mixed feelings about them. Oh — I take that back! There is one character, I won’t say anything, who I’ve had mixed feelings about from the beginning, but I did that deliberately. I don’t know, it’s possible you and I are thinking about the same character, but there’s a purpose to making one character not as likeable as the others. LB: I think her life is complicated — it’s enriched by her friends, but it’s also definitely complicated by all her relationships. LB: I like that. I like that there are never any particularly easy answers. But there are definitely moments when it’s always worth it. SF: Well, I also want to — I just finished plotting the fourth book in the series. And you’re sort of looking at all the people that you’ve already created for this town. You don’t want to keep killing someone who’s always in the town, because the town would be depopulated within about twenty books. But I need to have enough people that the reader knows that I can put into jeopardy, that I can call into question. So you think about those supporting characters and you give them a little bit more of a spotlight with every book for a reason. Because I may have to call on them in book five or book six. I may need them for something. They may end up being a murder suspect or being in danger, or even being the murderer. So I think authors are always looking three steps ahead. That we’re adding on to all these characters. We gave a character a particular flaw or a particular interest for a reason, because we, even subconsciously, we’re going to use it in the future. LB: Now we have to talk about berries. SF: Okay! I love berries. LB: I can tell! [Laughter.] I love berries, too, and I had no idea that berries could be used in so many different ways. SF: You know how I learned that? I live in Saugatuck/Douglas, and 17 miles to the south of us is a beautiful little town called South Haven, and a store there called The Blueberry Store. And it sells nothing but blueberry products. Jams, blueberry jerky, ice cream — everything blueberry. And I was fascinated by this store, I’d go there all the time. I love blueberries. And I thought, well, what if I just expanded that? What if I just made it ‘berries.’ There are dozens of different kinds. I’ve discovered berries I didn’t know existed. And I thought I could get a lot of mileage out of berries. Because you have to think, too, especially with cozies, about titles that are somehow related to the subject. So I thought, I have a lot of berries that I could use and sort of play around with for interesting cozy mystery titles. And it’s fascinating to me; I’ve gone to orchards and talked to the people who work there. I’m literally surrounded by apple orchards and berry farms. That’s what we do here in Allegan County. LB: I did not actually know that berry farms were a thing. I mean, I’ve been to pick-your-owns, but I didn’t realize that there were actually berry orchards. SF: Oh, huge berry orchards! Michigan probably grows more blueberries than any other state in the country. I literally can get in my car right now, I’m three minutes away from a blueberry farm. SF: Well, you know how this all happened? In the 19th Century, Douglas and Saugatuck, they’re really two villages right next to each other, were lumber mill towns. And after the Chicago Fire, Chicago needed to be rebuilt, the saw mills here provided all the lumber that rebuilt Chicago. We also took down all of our trees. So the towns had to do something to make a living, and they began to grow fruit. And that’s really how this became a fruit belt: after we destroyed our trees, we decided we’d better do something. Let’s plant some orchards. LB: Oh my gosh, that’s amazing. LB: Lucky for us that it turned out that way. I just want to ask about some of the recipes that you create. So, within your books, you use berries as everything. They’re wine, they’re clues, you sell them, they’re jam. They’re everything. But you also provide recipes at the back. SF: I would hate not to include a recipe. If you don’t include recipes, you’re going to hear about that. So you really need to put a few recipes in there. LB: I didn’t realize that berries were so versatile. LB: Are you a cook? Do you love to cook with berries? SF: I love to cook with berries. I like the juxtaposition of the sweetness and saltiness of recipes, especially something like a marinade for chicken. But I’m gluten-free, so I have to test all the rest of the pastry recipes on other people because I don’t eat gluten. That’s my only drawback. LB: Oh, no, so to be one of your friends means to have to taste pastries for you! SF: The strawberry cobbler that I made that I can’t taste. LB: Oh, dear! When can I next make a trip to Michigan? SF: The interesting thing is — well, the next book, next year, is going to be blueberries. But the one after that is elderberry, so I’m not quite sure. I’m thinking about that. I mean, elderberries have a particular taste, I don’t know how many elderberry recipes, pastry-wise, I’d be able to put in. I may have to think of something else to do with elderberries. LB: Well, they’re very famous: elderberry wine from Arsenic and Old Lace. SF: Yes! I guess I can recommend people drink elderberry wine. Or, you know, elderberries are used for cold and flu remedies and that kind of thing. But I might have to go in a different direction for the back of the book, for the elderberry mystery. But that’s two years away, so I’m not going to worry about it right now. LB: And a pretty good problem to have. LB: So, what is next? You’re talking about all these books that are coming out; what is next for you? What’s coming up? SF: We’re really right in the middle, Meg and I, of writing the fourth D.E. Ireland book, With A Little Bit of Blood. So we are totally involved in that. I just got through plotting the fourth Berry Basket book. You know, my agent keeps asking, do I have an idea for a stand-alone or another series, but right now we’re kind of pushing at the edge right now with two books a year. It is a lot to do for us, especially when you factor in all the promotion. So I, I mean, I have ideas. I’d almost like to go with a stand-alone suspense, and I have an urban fantasy that I’m part-way through, but at the moment, I just don’t have the time to devote to a whole third venture. SF: I read nonstop! If I didn’t read, I’d go mad. I read everything, all the time. I love, some of my favorite cozy authors are the classics, like Laura Childs and Cleo Coyle. I love Bailey Cates’ Magical Bakery mystery, which is so fun. I’m born on Halloween, so I like paranormal mysteries a lot. I have a great debt of gratitude to Gillian Roberts’ Amanda Pepper mysteries. I really discovered that series — I’m going to go back to my dad, but it was an important part of my life — when he first became ill and we were spending a lot of time in hospitals and nursing homes. It was so draining. And I’d go home every night, and discovered her books. It was such a relief to lay in bed and read a cozy mystery about a high school English teacher in Philadelphia solving murders. Because her books are also quite witty and funny. It was just such a needed break. Sometimes I listen to people and they say things like, oh, cozies are so trivial and kind of lightweight compared to the other mysteries. But it got me through a hard time. And I think that’s what a lot of books do. You need a break, you need a diversion. And they’re just as important as something that’s hardboiled or dark and intense. I love cozies. I think they do a great service. I haven’t met Gillian Roberts yet, I would love to and just say, Thank you. Thank you for getting me through a really tough time. LB: Well, Sharon, thank you for the fabulous books you give us. If someone wants to find you online, how can they? SF: My website is SharonFarrowAuthor.com or I tweet @SharonFarrowBB for Berry Basket. And I’m also at DEIreland.com and Twitter @DEIrelandAuthor. LB: Terrific. Thank you so much. Thank you for joining me today. SF: Oh, you’re so welcome.